Who Are the Red Lanterns? Green Lantern » Who Are the Red Lanterns? Red Lanterns channel the coalesced anger of all sentient beings – they harness the acidic red rage energy residing within the Emotional Spectrum. Having endured unimaginable personal loss, the Red Lanterns utilize the all-consuming power of universal hatred to enact brutal vengeance upon those who carelessly dispense lives across the cosmos. The story of the Red Lanterns begins with the very first Red Lantern – Atros, an aesthetically terrifying but surprisingly peaceful being hailing from Ryut, a planet residing in Space Sector 0666. You see, everything was coming up Atros – he had a loving wife, a beautiful daughter, and a promising career as a psychologist. However, that was all going to change – horribly -- thanks to a serious malfunction suffered by a robotic, cosmic police force pre-dating the Green Lanterns. Before the Guardians of the Universe created the Central Power Battery and the Green Lantern Corps, they utilized a host of robotic sentinels – the Manhunters -- to uphold order throughout the universe. Unfortunately, being robots, they depended on programming – programming that was “accidentally” corrupted by an especially volatile Oan (aka, Guardian), Krona. This malfunction caused a strain of overzealousness in the Manhunters’ prime directive. Their new mission? To extinguish all life, starting with Sector 0666. During the androids’ merciless assault, a severely injured Atros watched in horror as his family was brutally murdered. Historically referred to as “The Massacre of Sector 666,” this act of “accidental” genocide initiated horrific changes in the formerly peaceful Atros from Ryut. Atros was one of five beings to escape death during the Manhunters’ razing of Sector 0666. He and the other 4 creatures (who looked equally terrifying) formed a terrorist Cabal known as the Five Inversions. Bent on destroying the Guardians of the Universe and their supporters, Atros – now Atrocitus – commanded the other four Inversions, a sizable armada, and a sizable patch of space known as the Empire of Tears. During the Inversions’ reign, they performed graphic, magical rituals and divined the prophecy of the Blackest Night – a prophecy that portended the end of all things. Eventually, the Guardians defeated the Empire, and Atrocitus – and the other four Inversions -- were imprisoned on Ysmault, the empire’s former capital. Abin Sur, the Green Lantern who would later bequeath his ring to Hal Jordan, arrived on Ysmault in search of survivors aboard a crashed starship. Atrocitus offered no help, but his comrade Qull offered the answers to three questions: the location of the survivors, the fate of Abin Sur, and the prophecy of the Blackest Night. After relaying this information to the Guardians, Abin Sur returned to Ysmault on several occasions to properly prepare for, and stop, the Blackest Night. So desperate to mitigate the prophecy, he agreed to Atrocitus’ aid and freed the prisoner for a journey to Earth – the apparent birthplace of the “black” that would extinguish existence. While traveling to Earth, Atrocitus betrayed Abin, instilling fear in the Lantern and thus weakening his constructs. Mortally wounding Abin with a slash across the chest, Atrocitus fled the vessel before it crashed into the California desert. Time passed, and through divining magic, Atrocitus located the human who, according to the prophecy, would become integral in bringing about the Blackest Night – one William Hand. Atrocitus attempted to kill Hand, but was bested by Sinestro and his Green Lantern-in-training, Hal Jordan. After his capture, he was eventually returned to Ysmault. Growing more enraged and tortured by the knowledge of the Blackest Night, Atrocitus tapped into the overwhelming rage energy of the Emotional Spectrum, beat the other four Inversions to death, and used a combination of blood and magic to forge the very first Red Lantern Power Battery. Mainlining the Red Spectrum, he vomited columns of blood-soaked hatred which enhanced his already powerful blood-magics. And, with this newly enhanced blood-magic, he forged his very own Central Power Battery positioned before a massive, bloody lake. From this great Power Battery came a flock of portable Power Batteries and numerous Power Rings to arm his Red Lantern Corps – sentient beings who survived great loss, and whose tragedies demanded vengeance. When one has great rage in his/her/its heart and accepts the Red Lantern Power Ring, one’s heart is rendered useless, and one’s blood is turned boiling, toxic, and ultimately expelled in a spasm of excruciatingly violence. And no, it doesn’t stop there. 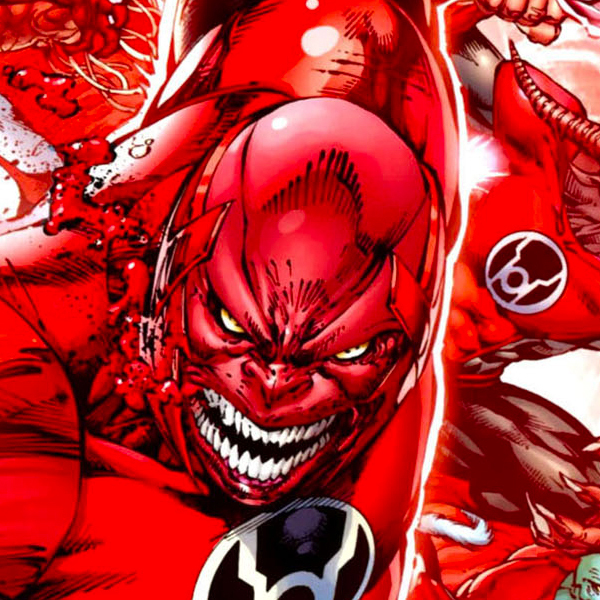 A newly-minted Red Lantern turns frightfully animalistic – apparently, Atrocitus is the only Red Lantern who maintains a semblance of self-control. Once Atrocitus gathered a significant army, he attempted to capture and execute Sinestro – he was being transferred to Korugar by a contingent of Green Lanterns. Initiating his ‘War of Light,’ however, was painfully unsuccessful. It seems the Yellow Lanterns were also waiting to ambush and emancipate their imprisoned leader, and the Blue Lanterns appeared when the Green Lanterns were sufficiently rage-possessed by the Red Lanterns. Atrocitus managed to escape, and the first Red Lantern resumed countless plots of revenge (mwah-hah-hah! ).